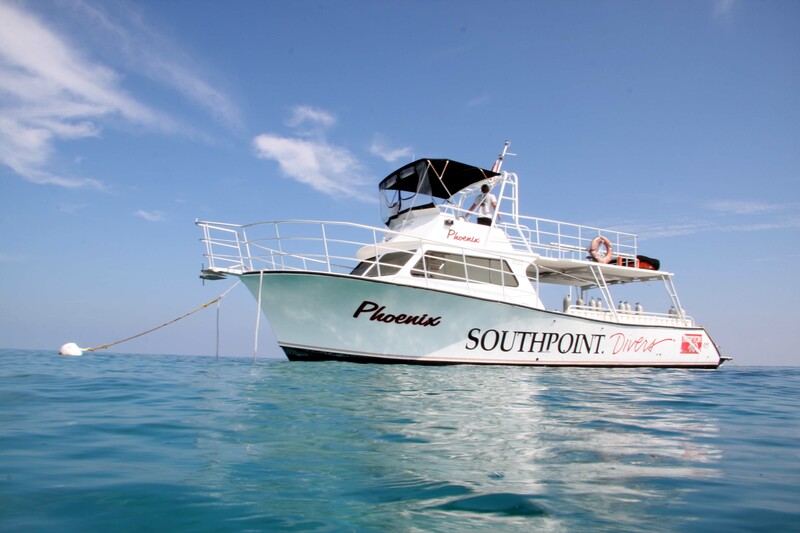 Southpoint Divers is located in the heart of Old Town, Key West on Front Street. Our shop, stocked with all your dive essentials and ScubaPro gear is at 606 Front Street and our custom dive boat, The Phoenix, docks directly across the street at the Hyatt Resort and Marina. Southpoint Divers has been in business since 1991 and is consistently voted the best dive shop in Key West! The M/V Phoenix is a 46′ Newton Dive Boat built in 2000. The custom configuration features two dive ladders and a large swim platform at the back of the boat for easy giant stride entries. She also comes equipped with a camera table, camera buckets, two fresh water showers, fresh water hose, marine head, ample storage space for gear and dry bags and state of the art electronics. Phoenix is set up perfectly to ensure your comfort and space! We pride ourselves on having the most professional and safety-conscious Captains and Crew and we hope you enjoy your Southpoint Divers experience! 2-tank, boat dives. We dive the Vandenberg in the morning and our afternoon dives are usually reefs. We also do night dives on Wednesdays and Saturdays. Call for more information! View Options & Book Online!